Read the true story of Saint Nicholas of Myra, the man who gave what he had to help others because he was grateful for what God had given him. As a young boy, Nicholas learned the story of Jesus from his parents. When he grew up, he lived out his Christian faith in a unique and selfless way that we still celebrate today. The stories we tell about Santa Claus say that he gives only to those who are good or nice. The story of Nicholas reminds us that God gives based not on what we deserve but on his overflowing love for us. 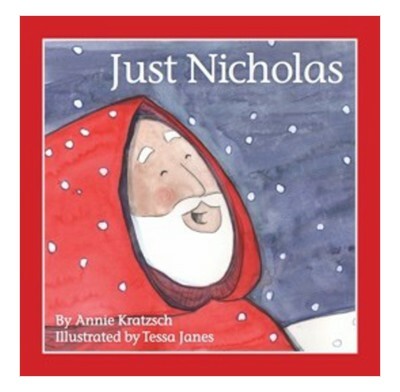 A helpful parent resource section includes questions to explore with your children as you read Just Nicholas and make the man before Santa part of your Christmas tradition. Lovely book: beautiful illustrations and nicely written. However, I’m really glad I ordered the copy to come to me instead of straight to my god daughter. I thought the book would be a nice link between Father Christmas and the love of Jesus - which it is, but probably for an older child who knows the truth about Father Christmas! That age is different for every family, but this book does give it away! The style suggests this book was intended for under 6, I would say, but I think I’ll wait til my god daughter is nearer 9 or 10 but then she might find the illustrations too babyish. Tricky!